Audio for this story from Weekend Edition Saturday will be available at approximately 12:00 p.m. ET. 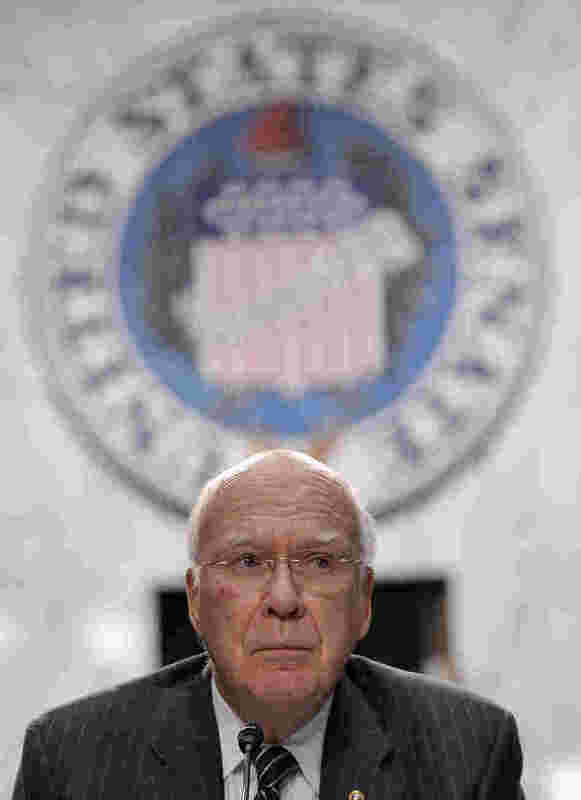 Senate Judiciary Committee Chairman Patrick Leahy holds a hearing on gun control in Washington, D.C., on March 7. The committee has since passed two bills on guns that are headed to the full Senate. Two more gun control bills are heading to the Senate floor after narrowly winning approval from the Senate Judiciary Committee this week. The legislation requiring background checks for nearly all gun sales will likely face stiff opposition in its current version. But it's the second proposal, banning assault weapons, which may get particularly heated pushback from lawmakers. Maybe if zombies attacked, you might need a semiautomatic assault weapon for self-defense. That was one concession Sen. Patrick Leahy, D-Vt., was willing to make this week when the Senate Judiciary Committee was debating the assault weapons ban. But short of an entire zombie takeover, Leahy says he's always been perfectly satisfied with his .45-caliber at home. "Even when we had people escaping from prison announcing they were going to kill me, I felt pretty comfortable with that," he said. Of course, what's a legislative debate without a few extreme examples? Sen. John Cornyn, R-Texas, joined in when he said that taking assault weapons away from law-abiding citizens would leave them outgunned by criminals. "We're going to give the American citizen a pea shooter to defend themselves with," he argued. Pea shooters and zombies depict a scenario that seems almost a planet away from the murders in Newtown, Conn., that launched these legislative efforts. Democrats in favor of the assault weapons ban, like Sen. Richard Blumenthal of Connecticut, aren't deluding themselves about the political realities. "Realistically, the assault weapons ban faces a very steep uphill climb," Blumenthal said this week. "But nothing is impossible after Newtown, which so powerfully changed things. We are all different after Newtown." Still, the National Rifle Association has made clear that it will oppose any assault weapons ban. So Blumenthal and his allies say they have greater hopes for a separate provision within the bill — one that bans high-capacity ammunition magazines. A Fate Worse Than Death Panels?